Darrell Figgis was born in Rathmines, Dublin, but spent the first 10 years of his childhood in Calcutta in India where his father worked as an agent in the tea business. As a young man he worked in London at the tea brokerage owned by his uncle and it was at this time that he began to develop his interest in literature and literary criticism. He moved to Achill Island to write and learn Irish at the Scoil Acla Summer School and to gain an appreciation of Irish culture. 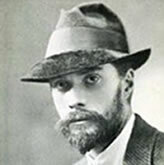 Figgis was a poet and in 1910 he joined the Dent publishing company. However, after his detention following the Easter Rising, he and the publishing house ‘parted company’. Subsequently he established his own publishing firm. Figgis joined the Irish Volunteers in Dublin in 1913 and organised the original Battalion of Volunteers in Achill. While in London, he became involved with a group gun runners who financed and supplied German rifles to the Volunteers. Although he did not participate in the 1916 Easter Rising, Figgis was arrested and interned by the British authorities between 1916 and 1917 in Reading Gaol. After his release, Figgis returned to Ireland. At the 1917 Sinn Féin Ardfheis he was elected Honorary Secretary of Sinn Féin. In May 1918, Figgis was arrested for his alleged part in the spurious German Plot and deported to England. In 1918, he became editor of the newspaper The Republic. In 1922 Figgis was a member of the Sinn Féin Ard Chomhairle National Executive. He was expelled from the party at this time for attending a meeting of the Farmers Union and encouraging them to support the Anglo Irish Treaty. Following this, an assault on Darrell Figgis took place at his home in the presence of his wife Millie. In 1924, Figgis’ wife Millie took her own life, a year later the death occurred of his new love, Rita North. Figgis himself committed suicide in London just a week after giving evidence at the inquest into Rita’s death. He is buried in the West Hampstead Cemetery, London.